A few months back, I was sent the Wind X-treme. When it came I was so excited to try it out, but it was so cold outside and the fabric was incredibly lightweight. I thought for sure that it would not be warm enough for the Maine winters. Then one chilly morning, my thicker hat was in the washing machine, so I pulled out the Wind X-treme. After a 10F day run, I was quite pleased with how warm my head was during the run. After that run I was sold. I also loved the fun print. 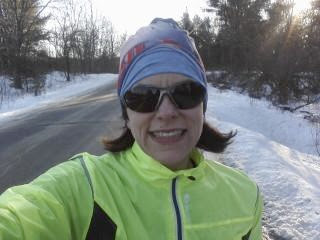 It is different from most of my winter running hats (boring black) and it looked great with my fun Sugoi running jacket. The Wind X-treme became my go-to running hat in no time at all. I am positive after trying out Wind X-treme for yourself, you could add even more activities to the list. I see myself wearing it more and more as a headband as the temps continue to rise this spring. I loved that the back of the package included a visual of ideas of it's uses and even some directions for the bottom two uses. Most importantly, if you choose to try out the Wind X-treme, it's best to just play around with it. Wind X-treme is also great for all members of the family. It is definitely Izzy approved. I've had to retrieve it from her bedroom many of times. You should definitely visit Wind X-treme for more information about this incredible product. Visit them on their website here and on facebook here. Let them know Jen from Running With The Girls sent you over. This looks really awesome! It would definitely be good here in the windy city Chicago. It is awesome! I bet it would be helpful for you there. I looked at the web site and they show different product categories ("Wind", "Cool Wind", "Polar Wind", "Peak Wind", etc). Do you know which one yours is? Looks interesting and at $25±, seems pretty in line with other less multi-functional products. I had the "wind"! I like that for the price it has quite a bit of functions! Awesome things, hubby took a couple up Kilimanjaro when he climbed it and he said they were great. I love it! I got something similar to that I keep meaning to review it, it has a fleece end and an end with material similar to yours. I took it for a test run recently and loved it. I love that it is so versatile. I like the idea of a fleece end. I bet it's nice and comfortable. I've never seen anything like this before..so it's awesome that there are other products out there. I definitely agree with you that it's great for those runs that you'll get the random chill or wind. I even found it to be warm enough for the cold winter! That Izzy sure knows how to pick great gear. She loves wearing my running gear all of the time. Looks like a great product, reminds me of my Survivor buff!!!! I've never seen a Survivor buff. I will have to check it out. The Surviror Buff is more of a promotional item. This is a higher end product than what you are thinkin. 10F?? Oi! I'll take your word that it works. That's cool its light weight but still does the job. I don't know what to wear!